Single-Payer Health Care: What Will It Take to Pass It? Single-Payer Health Care bill HR-676 covers 100% of everything with the least taxpayer money! What will it take to pass it? And why is neither S-1804 (see below), nor a “state-by-state” approach, the answer to the health-care crisis? 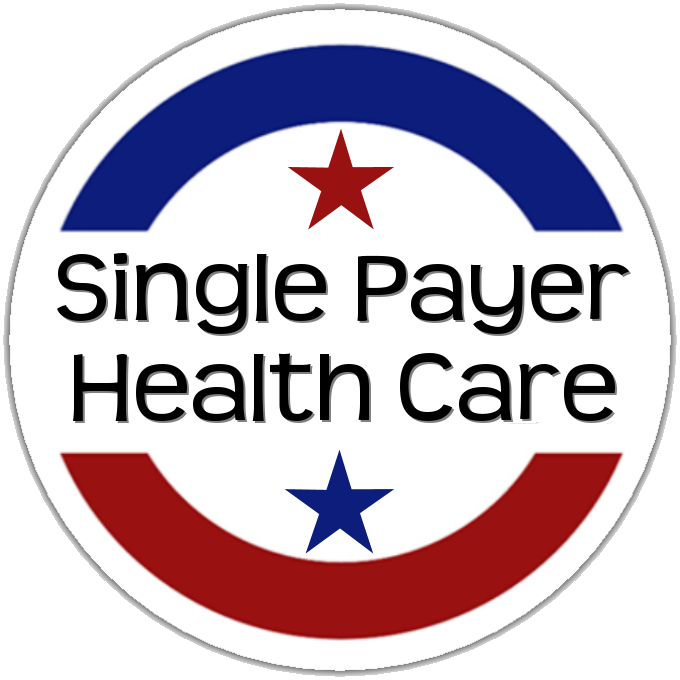 President Truman proposed universal health care for the United States in 1945, and health care for everyone, covering every medical necessity and costing less than we now pay, has always been the goal of the single-payer movement. So why is it that 73 years later, we still don’t have it? Many universal single-payer health care advocates have been led to believe that the only way to achieve our goal is via an incremental approach. The two most popular forms of this approach are state-by-state single payer, and surprisingly (at least in its current form) Senator Bernie Sanders’ “Medicare for All” plan S-1804. While desirable for some things, unfortunately, in the case of sweeping changes such as universal health care, an incremental approach is a blind alley that will delay our success — likely by decades. As Ralph Nader points out, passage of traditional Medicare to cover the elderly, “vented off” the elderly activists, which is a big reason the movement for universal coverage did not achieve its goal long before now. Paraphrasing Nader, any time you try to accomplish a sweeping comprehensive movement in a “piecemeal” fashion, you “vent off” a portion of the steam that is needed to fuel the movement. Until now, we have been “venting off” the steam we need to make our movement grow to the massive popular groundswell it must become to reach our goal. Instead we have been compromising and settling for partial solutions: first traditional Medicare, then HMOs, then the Affordable Care Act (“Obamacare”) and Medicare Advantage, and now state-level single-payer and Bernie Sanders’ bill, S-1802(full text available here). All these have covered (or will cover) a significant portion of people, removing their steam from our movement, thus politically making it even harder to reach true universal coverage. The enormous amount of corporate money in today’s politics (including campaign funding of leaders of both major parties) is a huge challenge. This is why we must not give them any opportunity to divide and conquer us in our movement for nationwide single-payer. We have to be even more careful to keep our full head of steam and not “vent” any of it on what seem like partial steps toward our goal, which are really diversions that divide us and dilute our power. In fact, the current diversion of our focus toward incremental approaches is allowing corporate-funded politicians to appear supportive of universal single-payer healthcare, while not having to worry that they are aligning with anything that would actually threaten the for-profit health care industry that funds their campaigns. Realizing that any step-by-step drawn-out approach will ultimately fail, some of the corporate-funded Democratic politicians are now giving lip service to state single-payer plans and/or to S-1804, in order to appear more progressive, and thus attract the votes of their party’s majority progressive membership. So, let’s first address the problems with the arguments for the state-by-state approach, and after that, the problems with Senator Sanders’ bill as it stands now. The claim: Canada used province-level (Saskatchewan) reform as a springboard to national legislation. Reality: Canada in the 1960s was much different than the United States today. Saskatchewan had a socialist government for many years before passing and implementing universal health care. 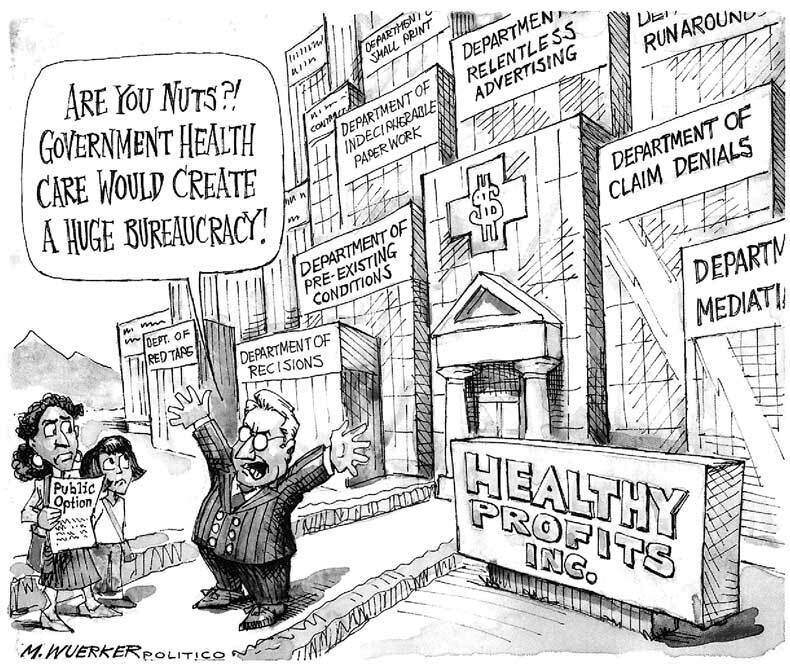 The health insurance industry back then was also nothing like today’s mega-corporations. In addition, the major complaint we hear from Canadians seems to result from the fact that instead of having a single national plan, Canada has 13 provincial and territorial health care insurance plans. Every province administers the Canadian National Health insurance differently. Since provinces greatly differ in affluence and population density, this creates a problem with inequity of provider distribution, similar to the inequality of access among our state-administered Medicaid systems. A nationally administered system avoids such pitfalls. If Canada hasn’t been able to consolidate its 13 plans into one, what chance would we have to consolidate a collection of 50 state plans (plus Puerto Rico and Washington, DC)? The claim: In some locales, passage at a state level has been thought to be less challenging than trying to achieve Congressional action on a national level. Reality: Today, those who want to prevent passage of single-payer (pro-corporate members of both major parties, the Chamber of Commerce, and medical-industrial corporations) can do everything at the state level that they can do at the national level to prevent its passage. As I mentioned above, some national Democratic Party leaders are promoting state-level single-payer, realizing that state-level is not likely to work out. They can use it to appear progressive, while actually undercutting what will really work — national single-payer. To include enrollees of Medicare, Medicaid and CHIP (Children’s Health Insurance Program) in any state single payer will require federal waivers. While the Health and Human Services (HHS) Department can grant Medicaid and CHIP waivers, an act of Congress is required for a Medicare waiver. Michael Lighty cites existing federal waivers for Medicaid as a possible way to divert federal Medicaid money toward state-level single-payer. He goes on to propose other possible routes to waivers (certain provisions in the ACA). However, all of these are convoluted, speculative, and their success would depend on interpretation of politicians at a federal level. Even if Lighty is right, if waivers can be obtained as he suggests, they pose big risks. Conservative forces in some states can take advantage of loosened federal rules on Medicaid and Medicare to further undermine these programs. Arkansas took advantage of the waiver process to fully privatize its Medicaid program, allowing higher premiums than federally authorized and eliminating coverage of non-emergency medical transportation (an otherwise required benefit). Indiana’s waiver includes making coverage effective on the date of the first premium payment instead of the date of application, elimination of retroactive eligibility, and barring certain “expansion adults” from re-enrolling in coverage for six months if they are dis-enrolled for unpaid premiums. A three-month lockout for re-enrollment was approved in Montana. In fact, there are many examples of extreme inequity already existing among the individual states with regard to health care (esp. Medicaid). Resolving this will require intervention on a federal level. Movements toward state single-payer plans in places like Vermont, Colorado and California have been derailed at various points in the process, providing examples of the political difficulties of creating and enacting state-level single-payer legislation in today’s political climate. It is a fallacy that statewide single-payer is easier to achieve than national. Even if a state could pass and implement single-payer, the for-profit medical-industrial complex would target that state and work to undermine the program. There would be so many challenges that they would no longer have time to be part of the national struggle, thus dividing our resources and diminishing our movement for universal coverage. The claim: Most U.S. social movements have started at the state level. State-based efforts empower local leadership, which is critical to development of a nationwide movement. State legislators and local politicians who become single-payer supporters influence (and sometimes become) U.S. representatives and senators, and media outlets are often more willing to cover state-based efforts. Reality: While all these things are true, we are not starting from scratch. State-level single-payer movements have helped make “National Improved Medicare for All” part of today’s national conversation. Thanks in part to that advocacy, we now have a large nationwide movement. 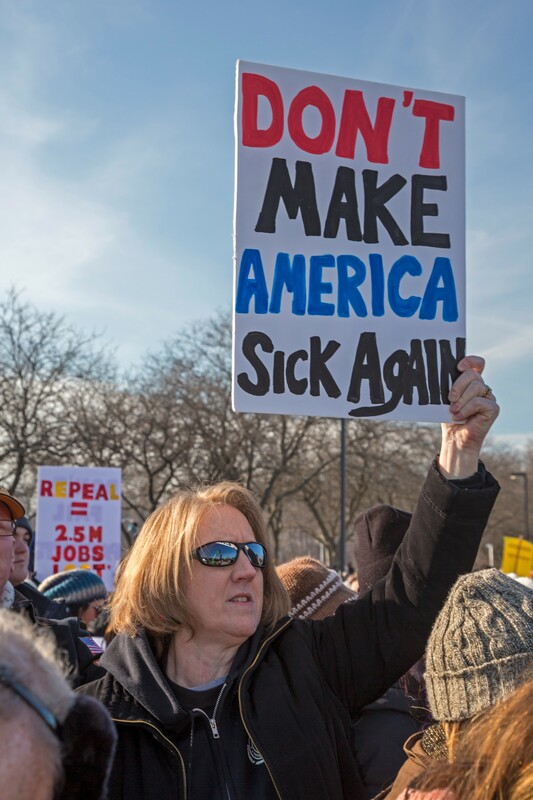 Trump’s election and subsequent actions have led to a further surge in activism at the national level around many issues, including single-payer. So, it is time to turn our experience and energy toward passage at the national level. At least a 60% majority of voters nationwide favor national single-payer health care modeled on Medicare. This is a major issue that crosses all party lines. Even 40% of Trump voters support it. Now is the time to urge all American voters to demand that their members of Congress pass it, or be voted out in the next election. It is time for state-level single-payer advocates, who have the crucial experience and relationships with local and state officials, to persuade those leaders to join them in lobbying national officials for HR-676 on a national level. The claim: State programs can more easily be tailored to address local problems (e.g. thorny rural health issues). Reality: Unfortunately, many states have terrible track records on dealing with these issues (often because there are such large discrepancies in wealth among the various states). Only a national system — where all money goes into the same pool — can afford to provide the same high-quality care in all areas regardless of the financial status or population density of any one area. The claim: If one state passes it, other states will see how well it works, making it easier to pass on a national level. Reality: In practice it’s virtually impossible for a state to implement a true single-payer healthcare system. If a state passes a bill labeled “single payer” and it fails to deliver the savings and quality long promised to the public, or if it fails for whatever reason, then our powerful, wealthy opponents will quickly saturate the media with the message that no single-payer plan will work. While some states might act on the example to move forward with their own statewide single payer, others will move backward. The Medicaid expansion disaster showed us the extreme vulnerability of people in those states that chose to take a backward step. 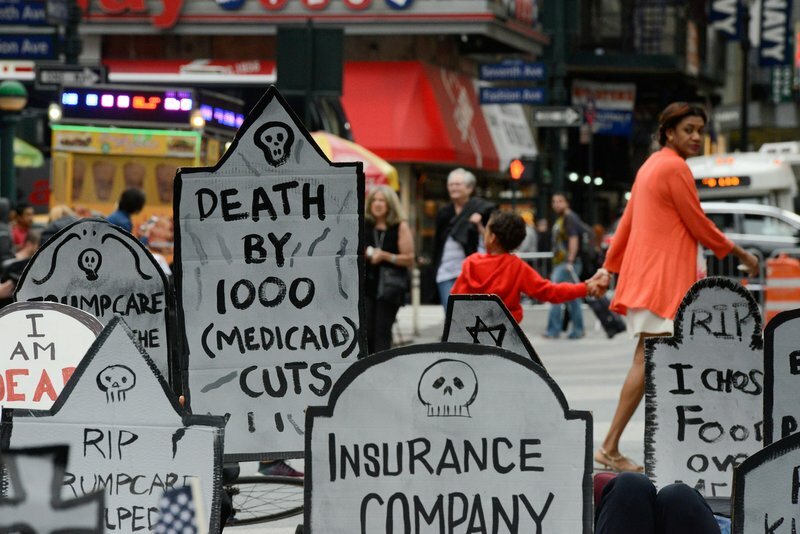 Some of the poorest states chose to forgo federal funding and gutted their Medicaid programs. It is just not ethically acceptable to leave behind the most vulnerable and most needy in some states, while others advance. Another issue is that there will be no portability of health care from state to state in a state-level system. It could even spur large migrations of people needing health care to move to states with single-payer, overwhelming these states with large numbers of higher-costing beneficiaries. Since states (unlike the federal government) have to balance their budgets, this scenario would be a nightmare for them. A state-level single-payer healthcare plan cannot bring in the large-scale savings of a national plan, because most states do not have large enough populations and economies to generate such savings. California is an exception with its enormous economy. However, because a state law passed in 1988 requires 40% of all state tax revenue to go to K-12 education, to raise enough money to fund single-payer, you would have to raise nearly twice as much — or this law would need to be repealed or drastically changed. 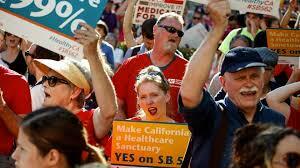 Such political challenges have derailed the idea of a California single-payer plan for the near future. The technical details of passing and implementing state single-payer systems will need federal intervention, and if we’re going for that, we may as well go for national single-payer, with all its savings and other advantages. There are other advantages available only through a national plan. Nationally, we can spend any amount of money to ensure “the human right to healthcare,” because unlike states, the federal government can print legal tender and can choose to balance its budget or not. We can force all U.S. medical-industrial corporations to negotiate with one buyer, so there will be no “divide and conquer” among states. Federally there is more infrastructure already in place for collecting taxes and billing for healthcare. The federal government can more easily address inequities of all kinds, and in particular, racial inequities among states. Only a federal plan ensures complete portability of health care coverage. With regard to workers compensation, national single-payer will separate responsibility for the injury from financial responsibility for the health care — so care would be completely covered, no matter where the injury occurred or who was responsible for the injury. S-1804 has a number of serious problems that must be addressed for it to become a true single-payer bill that will cover everyone equally, ensure the highest quality care, and generate the huge savings that HR-676 has long promised (and will provide). S-1804 leaves Long Term Care (LTC) out of the single-payer portion of the system by leaving it under state-administered Medicaid permanently. This is a really bad idea, since the track record of many states is horrible with regard to how they treat their Medicaid programs. This will negatively impact the most vulnerable in our population — the disabled and elderly (especially women and minorities). S-1804 leaves the for-profits in place for its planned four-year rollout, thus forfeiting the huge savings that immediate rollout of a true single-payer plan like HR-676 would generate, because 84% of the savings of a single-payer plan is from eliminating profit and paring administration down to one payer. This lack of savings, and the fact that it will be covering more people with more comprehensive coverage, will almost certainly result in at least four years of an overall higher cost to taxpayers than now. The “Public Option” would suffer this same fate. It would become one more weapon in the arsenal of those who oppose any single-payer system in the United States. So far, MACRA (with its promotion of “assembly-line” care, as opposed to individualized care) has failed to lower costs, and has been so adversely impacting physicians (with reams of paperwork) that many are burning out. In fact, in order to avoid the most onerous forms (required of doctors in individual practice) more and more doctors are joining ACOs/HMOs. This means that Medicare for All will become a system consisting almost entirely of ACOs/HMOs — not a desirable outcome. Some things can only be achieved in one large step. Trying to pass a national universal single-payer healthcare system incrementally is like trying to traverse a crevasse in two jumps — a fatal mistake! It will simply give the opposition more time to use its extreme wealth and control of media to sell myths and outright lies to the American public — fanning the public’s fears of any change, and killing any chance of success for at least a decade or more. The strategy that can work is to take advantage of the opportunity now, when tens of millions of Americans whose health care is already too limited and too costly, are at risk of having even that stripped away. We need to further inform the public, and urge them to demand that in return for their vote, their elected officials must actively support HR-676 in the House, and a companion Senate bill that is truly aligned with HR-676. We need to press Senator Sanders to transform his bill into a true single-payer bill that will deliver all the promises the single-payer movement has given the public for more than a decade, a single-payer bill that has a chance of actually being completely implemented without being shot down — one that is rolled out within only one to two years, not the four years that will simply give our opposition more ammunition. Lee Stanfield is a board member of Health Over Profit for Everyone (HOPE) and a non-physician member of Physicians for a National Health Program (PNHP). She is the founder of Single-Payer NOW Tucson. She is now retired, having worked in the medical field as a research and clinical assistant and technician, and as a case manager coordinating in-home services for disabled and elderly Medicaid patients, and as a mental health counselor at several mental health agencies in Tucson, Arizona. This article will appear in Against the Current #193 (March/April 2018).